I could go on and on about the various events that changed my perception. About everything that altered the way I see the world. Playing hockey in a league. Buying my first computer... a laptop. Learning to use a Cintiq tablet. Believe it... this little tool just changed my life forever.Although it took me about a week to properly set the tablet and get it to do what I needed... and even then... I would not be surprise if in 6 months ... if I will not discover a setting that will improve the performance of the tablet or the way I use the tablet. Heck my assistant has been using the Cintiq for quite some time... it is what he has been using at home... and he greatly improved in the two weeks he has been under my supervision. There is a difference to learning to use a something by your lonesome... and learning to produce professional quality work. It is quite a different matter. Although for the past year I have been pretty much exclusively working on a standard Wacom tablet at the studio... it has allowed me to develop some sort of expertise and greatly improve my work when the time comes to working digitally. When you try to learn in your free/spare time... there is only a limited amount of time that you can realistically spend to develop your skills on your own. But once you get to work on a production 40, 50, heck 80 hours a week... week after week after week.... you will learn and improve infinitely faster then the merely few hours a week you may managed to find to try to learn/improve on your own. So I got a lot of practice and got used this past year to drawing on a graphic tablet with a neat little program called Sketchbook Pro. As the name implies.... it is a great program to sketch in the computer. Why use Sketchbook Pro to draw as opposed to Photoshop?? One simple reason.... the way you can easily zoom in or zoom out. The zoom function is much more effective in Sketchbook Pro then the one in Photoshop. It may seem trivial... but when you zoom in or out 1000 times an hour... you must be able to do so effectively and very quickly. Even in doing comic work... I have started using Sketchbook Pro to "pencil" the work.... then in Photoshop I can do the final "inked" work. Why not ink it in Sketchbook Pro?? Photoshop is still better to get a clean finished drawing. So my work is now more precise... and much quicker. Luckily... since for the past month... my workload has been titanesque... and there is no way that I could have done it if I had still been using my old Wacom tablet. The only thing that drives me a little nuts... is that there is a small lag when I draw. Nothing too dramatic... but it is there still. So I would greatly encourage any artist to get such a tool. Although the tool alone means nothing. Some talent... and a certain expertise is still required. But the Cintiq makes working directly in the computer much more effective. I would especially greatly encourage aspiring artists to get one. It is much easier for most to learn to use a new tool early on. Some old workhorses are so used to drawing in pencil on paper... that getting them to even try a new tool is... at the very least... difficult. So if you are a new and upcoming artist... learn to use the Cintiq now as opposed to waiting later and then... having the drawback of being the old workhorse who is having a thought time learning to use a new tool. So learn to use it now while it will be easier. But the best part about the Cintiq is not the Cintiq itself. Although it is a step in the right direction... the best part is the hope it gives for the future. If we have the Cintiq to help us draw in the computer now... Imagine what we will have tomorrow??? Imagine IF we had a great tool not unlike the iPad on which we could draw just like the Cintiq. Remember when I mentioned Uncle Sam's appearance at the end of Blackest Night, and how it might signal the return of the Freedom Fighters to the DC Universe? Well, apparently I was right, as the Freedom Fighters will have a new ongoing title launching in September of 2010. Now, even though I predicted we'd see them return, I'm a little hard pressed to explain why someone would greenlight an ongoing series with these characters. That's a pretty low start with an dismaying drop through the months! And I think I know why - when you are pitching a series like US&FF, you are trading off of the awareness of the old characters to some degree. Elsewise, why not just create a new group of superheroes? However, when peddling a series with such a strong nostalgia factor, it seems switching out the characters with new (grim and gritty?) versions is a mistake which eventually erodes the sales of the title. And looking at the numbers between the two series, what are we to predict for the sales of the first issue of the new mini-series? Will it start at 23K like the Brave New World mini or will it start at 13K, the low end of that series? I think a tough marketplace and disenchanted readers are going to take a toll on this new series. What I would MUCH rather see done with the Freedom Fighters name is a sort of 1940's era Marvels Project 8 issue mini-series. Possibly illustrated in that same style with someone with a love for the era writing the series. I'm not saying Palmiotti and Gray would be bad. They handle Jonah Hex well enough, and that's a period piece. I just don't know how they would handle a WW II story. My dream writer for such a project would be Michael Chabon, as he's demonstrated an incredible knowledge of the history and feel of the Golden Age Era in both his novel Kavalier and Clay and his Dark Horse Comics The Escapist. It might also be interesing to see Darwyn Cooke such a project. Simply because I think his clean style evokes some of the simplistic beauty of the Golden Age. Until then I'll content myself with the classic adventures of Uncle Sam from the pages of Uncle Sam Quarterly! 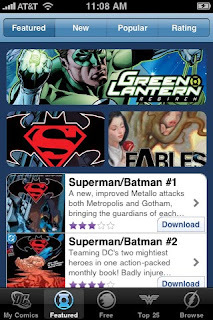 DC Comics has finally slipped their toe into the sea of digital comics with an iPad app through Comixology. We should say here and now that the DC app functions pretty much the same way the Marvel and Boom! apps function. If you have an iPad or are getting one soon then you may all ready know that the Comixology app works by allowing you to read the comic in a couple of ways: full page, dragging your finger across the screen, or "guided" where the app it self takes you from panel to panel as it's been programed to do. The app also features a slick, easy to navigate, branded store front. JIM - My first impression? The DC Comixology App has a nice assortment of comics overall. The only place I find it lacking is with older stuff - Sandman seems to be the oldest, it would have been nice to see some Bronze Age or Silver Age stuff. By way of contrast, the Marvel app currently has quite a number of Silver Age Marvels and just this week launched the first four Bronze Age Invaders comics (one of my favorite series!). CAINE - My first impression? DC missed the boat if you ask me. 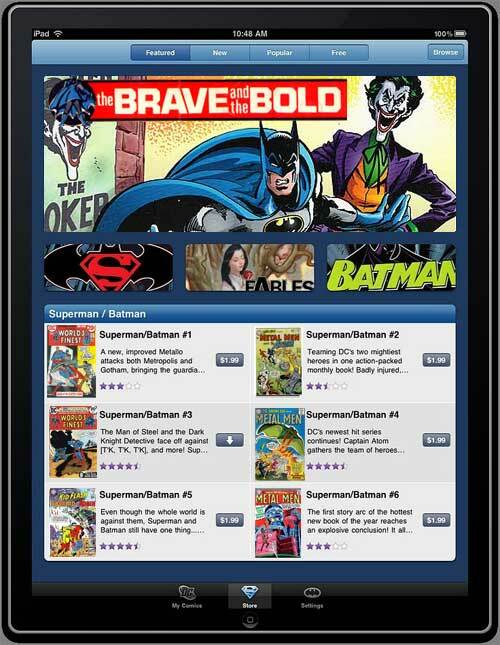 While the app is filled with Batman, Superman, and current popular titles there is little there in the way of an introduction to the DCU to the over 2M new iPad owners/ positional new readers. JIM - I think the app may have gotten rushed out the door because it seems that DC felt the need to make the fourth and fifth issue of Brightest Day, Generation Lost (which I’m reading and loving via ComiXology) returnable for retailers. I think that was a good plan to keep the peace with retailers but when you compare it to the amount of advance warning Marvel gave retailers with their Iron Man Day and Date release, it seems awkward. I suspect this is in part to some of the ongoing negotiations concerning creator's royalties that Jim Lee has mentioned. It would seem that that stuff wasn't hammered out ahead of time suggesting the timetable on this app may have gotten advanced. CAINE - I would have liked to have seen the app launch with more Secret Files & Origins (so far there are only origins for Batman & Green Lantern). Some Who's Who (which could double as iPad desktop imagery as they are largely pin ups with text boxes), & a few dozen number 1 issues (maybe bundled together 3 at a time for .99). JIM - While some of the "Browse by:_______" cross referencing had me a little confused I was happy to see Tiny Titans - Haigen will like that. It was also cool to see so many Vertigo titles present. This is really where DC can shine over Marvel, who don’t have anything to really compare to the type of outré fare that Vertigo gives DC. Currently, they have Sandman, Fables and The Unwritten. CAINE - I was glad to see Wildstorm titles; such as Wildcats, Gen 13, Planetary, & more. I would have been glad for the opportunity to purchase canceled books (particularly those with issues that didn't see print), or imprint books like Milestone or Impact (Red Circle recently) what about all the co-features? 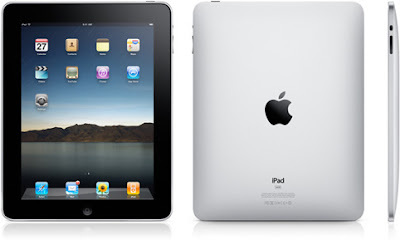 Why not give them their own package on the iPad? JIM - Yeah, some of those co-features would be great to see here! It was disheartening to see that there is only one title staring a female character, Mirror’s Edge. What I would like to see: some classic Brave and the Bold, World's Finest, or Metal Men in the app! CAINE - I would have liked to have seen some more Zuda comics in the app, they seem like they would be made for it. Only Bayou is currently in the app, High Moon would have been a major seller. JIM - Perhaps that's coming later? I wonder if other completed Zuda comics will show up in this format. For that matter, is this why Zuda was put on hiatus? So that DC could refine the contracts for those web comics? Or has a de facto judgment been passed on Zuda via the iPad? Has anyone (but me) read the Flashback Universe web comics on their iPad? If so we'd love to know what you think about them or any other digital comic in the comments field below. I have mentioned before how John Byrne was the king of the mountain in the 80s? Well if you need any proof... you need to look no further then the Secret Wars II Omnibus edition. I just got the Secret Wars II Omnibus... and one thing I realised as a I was reading it was how it was a veritable time capsule of what Marvel was publishing in 1985 and 1986. You had the New Mutants by Sienkiewicz. Captain America by Mark Gruenwald. The X-men by Claremont/Romita JR/Al Williamson. The Incredible Hulk by Mantlo/Mignola. The Mighty Thor by Simonson. 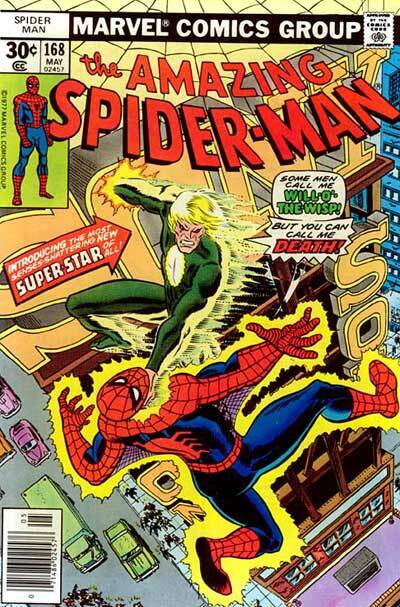 Amazing Spider-man... with the end of an era with the end (or close to the end) of Ron Frenz's work on the series. Cloak and Dagger by Mantlo/Leonardi. Heck even Power Pack by Brent Anderson and Scott Williams was pretty good. Captain America, Iron Man, Web of Spider-Man, Amazing Spider-Man, Daredevil, The Avengers.... and of course... Secret Wars issue 1. I will let you guess which version of the Omnibus I got. The Ed McGuiness one?? 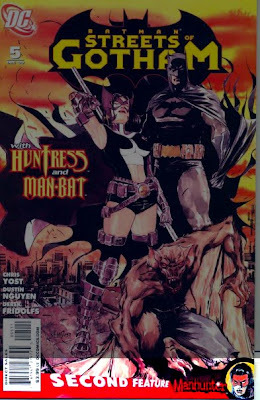 or the John Byrne one?? Byrne was really at the top of his game at the time. His work on FF and Alpha Flight was superb. And we even got a few special treats with him being inked on FF by Jerry Ordway, and legendary artist Joe Sinnott. And the tale Hero, from Fantastic Four 285 (where a kids hero worship of the Human Torch has unfortunate consequences) still brings a tear to my eye even now( what can I say... I’m a big softy). Damn... reading those stories reminds me how good it felt to read comics back in the day. But I had a good time reading that book. It was an EPIC Saga at the time. And now I got the whole tale. Now I know where the New Mutants went after being teleported by the Beyonder. Now I know the final fate of ThunderSword. Now I know what paved the way for Peter David's work on the Hulk. Now I know what happens to Algrim the Elf after the Beyonder healed him. 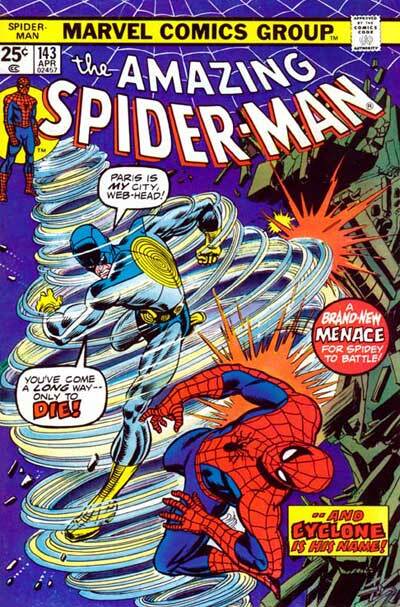 Was the complete first issue of Secret Wars II penciled by Sal Buscema. I am a huge fan of Sal's work. And when I found out that there was a version of a never published Secret Wars II issue by Sal.... I just knew I HAD to get it. Heck I even got the Omnibus of the first Secret Wars and was pleasantly surprised to see the pencils of the first issue by Mike Zeck. It was quite a treat. But I must admit that I was a little disappointed when I first opened my Secret Wars II Omnibus. Because the Sal Buscema pages were.... tiny. They somehow fitted 4 of Sal's pages on a single page. But luckily... thanks to my scanner and my friend Photoshop... I was able to make a bigger version of them pages to be able to see Sal's work properly. 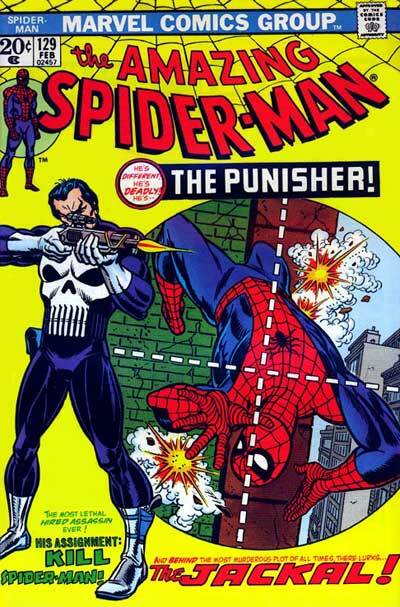 But with Sal's work... we also got a great sampling of most of what Marvel was publishing at the time. To get a sample of some of Marvel's best runs in history? To get a HUGE book containing no less then 45 comics? 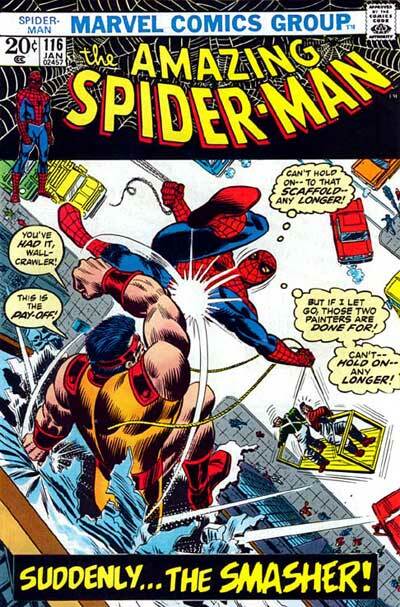 To get some never seen Sal Buscema work? I would strongly suggest this book to you. While no official word has come from DC on the matter, there was information in the following comments thread that confirmed this theory thanks to the guys at Marvel Masterworks, who had contacted DC on the story. I don't think this should really come to a shock to anybody. When the archive was originally announced, I commented on several messageboards that I thought the choice of reprints was a little awkward for company like Time Warner who I know from personal experience spends quite a bit of time thinking of ways to best look progressive and culturally diverse. This isn't the first time we've seen a big company flip-flop on a project like this as in 2003, the Fox Movie Channel discontinued a planned Charlie Chan Festival, soon after beginning restoration for special cablecasting, after a special interest group protested. Anyway, as a service to many of the posters on the Bleeding Cool message board who were asking about these comics, I present two issue from the series as todays Free Comics. All of the images today are iPad screen shots pulled down via email or my DropBox account. There are actually a lot of apps that will read comics, those you see above are only the highlights or "names" in the app store. The big 6 if you will. Now I'm sure that there are situations out there where you'll be able to produced some glare (maybe even some exceptional glare) but in general I've never had a problem with it and I've read comics in doors, out doors, morning, noon, and night. 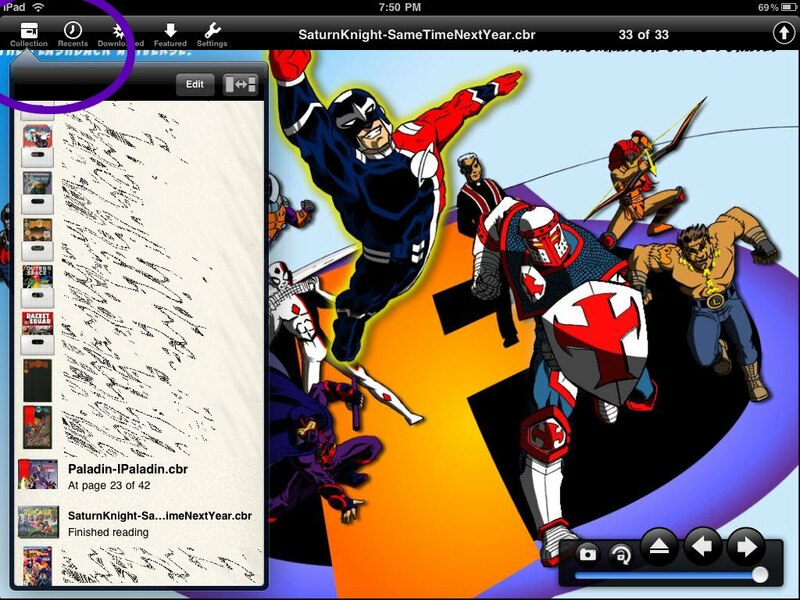 I've read comics created digitally as well as comics created for print and scanned. Glare has NEVER been a problem. Not only is it true that size matters but the iPad is sized perfectly for comics. You can turn it "portrait" and read the entire page or "landscape" and read a third of it. With just a simply drag of your finger on the touch screen you can pull the comic book page up (or down) to read the next third. COMIC ZEAL NOTE: "Soft Controls"
The commercial is true, the battery does last all day (so far). I've spent hours reading comics and watching Youtube videos and only depleted the battery down to 34% at the lowest. 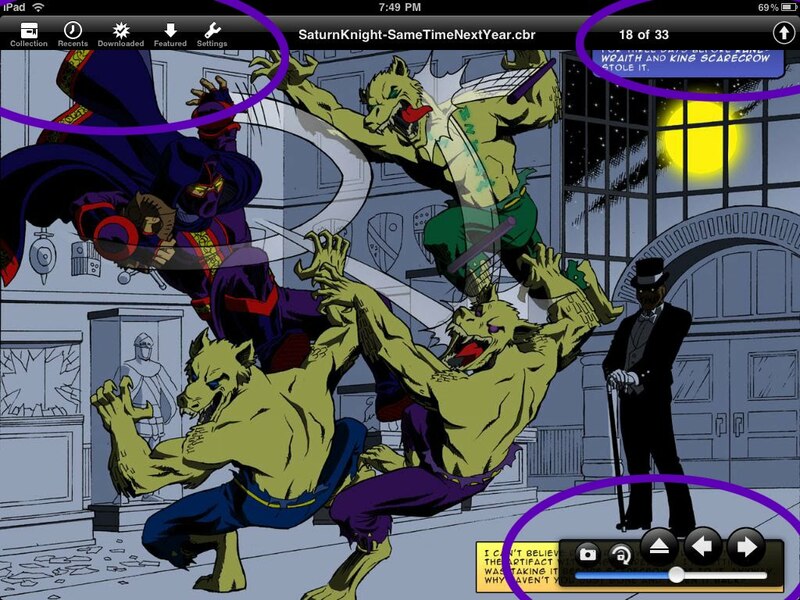 To get the comics you all ready own on to your iPad (with ComicZeal) all you need to do is drag them to the "sync" window in iTunes. COMIC ZEAL NOTE: "Hard Controls"
The text of a comic reads just like it would on the printed page. There is no distortion (other than what might be brought into ComicZeal gigo style - "Garbage In/Garbage Out"). COMIC ZEAL NOTE: "Intuitive Menu"
I have been mentioning how more and more... how artwork on a production is produced digitally. But sadly... despite all the advantages.... there are various drawbacks to using new technologies. Eons ago... artists that would work from home would use Fed-ex to ship their artwork to the studio. But now... with the "magic" of the internet... they can simply drop their work in the studio's FTP from the comfort of their home..... assuming that everything works fine. But sometimes.... when the storyboard artist tries to send a storyboard that is finished.... somehow.... half the pages can get corrupted sometimes. So that means for the artist a trip to the studio to bring the whole board thanks to something as simple as a USB key.... or to scan the board straight at the studio. A little tool as simple as a USB key is something that you must always carry with you. I always have mine in my pocket... and I cannot count all the times that that little tool got me out of a jam. But it seem to be something that has to do with some internet connections being too slow that after a given ammount of time.... before the page is finished uploading to the FTP... the FTP stops the upload and starts to upload the next page even if the previous page is not finished uploading. So you end up wih part if not most of the page missing/corrupted. It happens. Another problem that we often run into is how some programs are incompatible with each other. How not only Photoshop is somewhat incompatible with SketchBook Pro .... but also how Adobe Acrobat 5 is not compatible with Adobe Acrobat 8 Professionnal. The problem we noticed between Photoshop and Sketchbook Pro is that if we make a drawing on multiple layers with one program.... the other program will not read the layers.... or it will flatten the artwork. So when we need to work on layers for some reason..... everyone needs to use the same program. As for Adobe Acrobat... if someone adds notes to a PDF document for some reason with Acrobat 8.... somehow Acrobat 5 can no longer open the document. or it can open the PDF.... but not the page with the note added on it. So when you try to send some PDF ducument to your artists that work from home... and the artist can't read half the files... it becomes a big headache to try to get everyone to be able to read the references they need to do their work. But the MOST important thing that you need with new technologies is.....POWER!!! Sadly.... something like a power faillure can pretty much paralyse a whole production. And even when the power is restored.... it can still srew up the production if the server was messed up by the power faillure somehow. With a power faillure... at first... some figure they could work from home..... until they realise.... no power to get the files they need from their computer. Whether they need artwork... references... heck even the scripts are in the computer. And even once the power is back.... if your work in on the server.... and the server was messed up thanks to the power faillure... it means even more time wasted waiting for the server to be back online. In short... new technologies can help us do our job. But when things go wrong... it can go VERY wrong. It can pretty much crippple a production and stop it dead in it's tracks until the matter is resolved. Even when the matter is resolve.... it will mean a lot of sleepless nights in the coming days to try to catch up. Because although you could not work for a few days.... the deadline is still the same. Is a new Aqualad really a good idea? Over at Newsarama, it was announced that a September issue of Brightest Day would introduce readers to a new Aqualad (as the original Aqualad, who was going by the name of Tempest, was killed in Blackest Night. Or something like that.) This news has been met with a wide range of fan reactions, namely because of the fact that this version of Aqualad is a minority character, which runs counter to the trend Chris Sims at Comics Alliance noted which is that DC seems to be currently reverting minority versions of DC heroes to their Silver Age legacy versions. This character is supposedly linked to a new Young Justice cartoon coming soon. There is some resemblance, but the trading of dreadlocks for a blonde crew cut and blue eyes bothers me on some level, but let's not get into that right now. Why is DC introducing a new Aqualad when they just got finished killing a perfectly good new Atom? Won't he just be killed later when they decide to return the original Aqualad - like Jason Rusch Firestorm? The other master is the media arm of Time Warner, which doesn't necessarily feel comfortable peddling a cartoon with an all-white cast. So we get a new Aqualad, who may or may not be the son of Black Manta, which to me is sort of cool idea. I would have rather seen a new character for the Young Justice show as I have a problem with Aqua-anybody on super-team shows. Such charaters are either relegated to monitor duty when the adventure involves doing stuff on land, or when the crisis is in the sea, the rest of the team fits in awkwardly. So to me, this introduction of a *new* character feels like a wasted opportunity. IMO, the best use of Aquaman is when he was used in the 50's - as a guide to a world of amazing adventures where faux science fiction and fanciful magic are used to tell light hearted stories meant to do nothing more than tickle our minds with wonderous notions. People always claim Aquaman is hard to make interesting, but I really think that's just laziness. If you think of Flash Gordon and how he was a gateway to stories on Mongo, then I think you see how Aquaman could be better used. Writers get wrapped up in the enviromental politics angle with Aquaman, like that's all they have to bring to the table to make the story good. Having that be the be all end all of your story is just boring. You know what's not boring? Aquaman swimming through a dying mans bloodstream! What's sad, is that a previous switcharoo with John Stewart worked so well. With him as Green Lantern on the Justice League cartoon, millions of kids got to see an A-list hero of color with an honest to god Bronze Age legacy behind him. I remember Chaquita Davis, the project manager at a software company I worked for, telling me how her boys were so excited to see a black superhero on the Justice League cartoon. For them, and other kids I imagine, that was who Green Lantern had always been. As PC Replacements go (as some people call such things), it was the most painless AND successful I've ever seen. The sort of success that DC could have parlayed into using the character movies. And now, with the Green Lantern movie coming up, I'm not sure they will be as excited to see their Green Lantern has been replaced. Anyway, enjoy todays undersea themed Golden Comics: Blue Circle Comics featuring Maureen Marine! 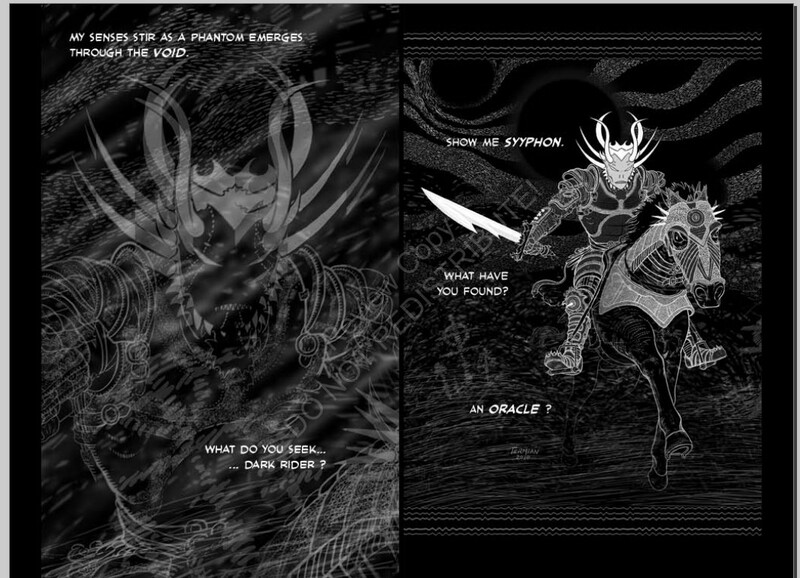 When Mark Bernal contacted us recently and asked us to review his recently published graphic story: Parallaxium. A digital download available now, we at the FBU were delighted help him out. "Parallaxium is a "first person" graphic story wherein the reader experiences the story through the eyes and mind of the main character. The main character is a research volunteer who's strange visions during testing, entangle the character between this universe and a bizarre medieval-like universe." Parallaxium Research, the study of the space between parallel universes. With that statement the reader is off and running thrust mind first into a roller coaster ride of an adventure unlike anything you've ever experienced in a 32 page graphic format. The preview we were sent consisted of 19 amazing page following an unwilling research assistance protagonist who's taken deeper and deeper into the Parallaxium that seem to flow through the assistant in such a way that he/she really can only classify them as dreams even though they are so much more. A bit like Alice down the rabbit hole, the researcher is pummeled with "vision" after "vision" as he/she races deeper inter his/her own psyche in order to come up with the understanding to put what he/she's experiencing together and process it. Parallaxium is filled with rich light over dark graphics that are filled with amazing locals and characters that are seemingly based, at least in part, on gods, myths, and monsters of all types. Each spun into a unique story element. We wish Mark Bernal great success with Parallaxium and hope to see more of it very soon. If you liked what you've seen/read so far you should check 'em out - they're priced to move! 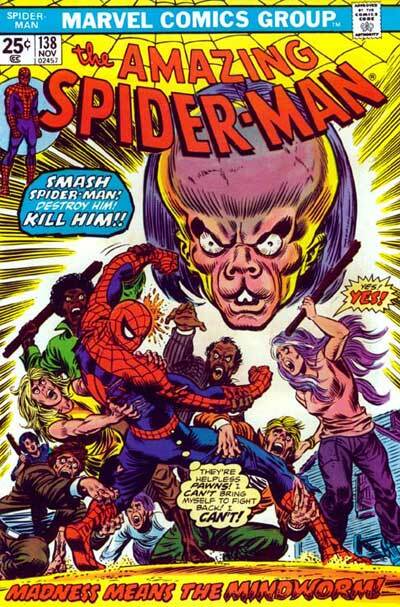 There is no doubt that the Lee/Ditko run created most of Spider-man's A list villains. 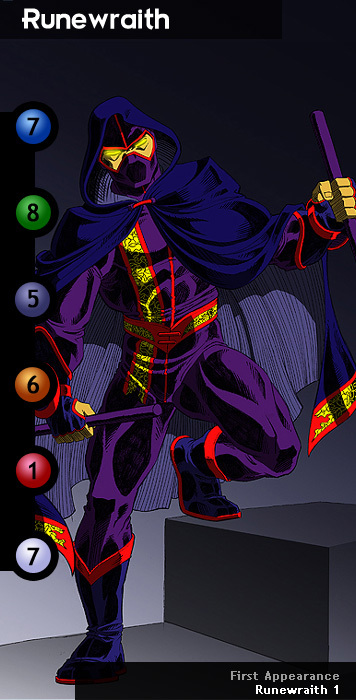 However, just like Flash's Rogues, the original Sinister Six get overused again (most recently, in the Gauntlet storyline), while many of the Andru Era villains get completely ignored, There are a few notable exceptions, who'll I'll mention in a the end of this post, but let's look at the list of forgotten villains. The Gibbon - Seemingly born a mutant with an apelike build and agility, The Gibbon later joined a circus where he excelled as an acrobat. 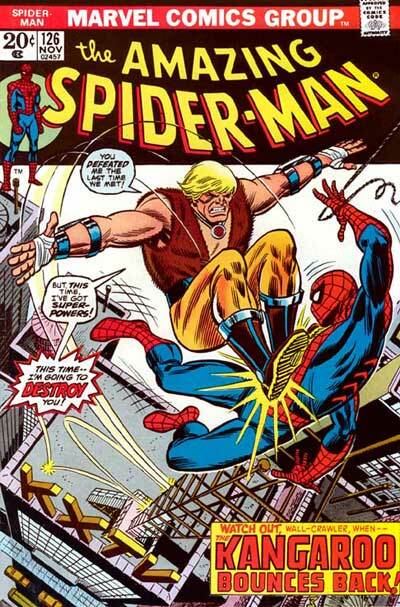 His powers were later enhanced by a potion given to him by Kraven the Hunter to "Unleash the Beast within". 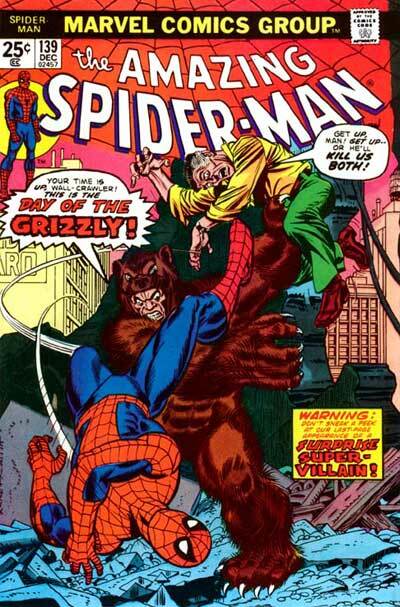 The Grizzly - Maxwell Markham was a professional wrestler whose brutal tactics caused J. Jonah Jameson to write a scathing editorial calling for an investigation by the wrestling commission. As a consequence of the hearings, his license was revoked. Later, he obtained a suit that augmented his strength from the Jackal. The Kangaroo - As a boy growing up in Australia Frank Oliver used to spend his vacations studying Kangaroos. He would live with the Kangaroos, going where they went and eating what they ate. Then he became a boxer but was banned after seriously injuring another. Cyclone - He was a N.A.T.O engineer who created the Cyclone a weapon of war, and was told that N.A.T.O didn't need the weaponary because it was purchased solely from America.Not long after N.A.T.O fired him and from his device he created a costume and became a criminal. Mindworm was a superhuman mutant with limited telephatic powers who was briefly a minor enemy of Spider-Man. He had an oversized cranium and was naturally extremely intelligent. Eventually, Mindworm attempted to reform but his problems were too difficult for him to control and he allowed himself to be killed by common street thugs to end his great suffering. Mirage was a Holographic technician who always wanted to become a costumed criminal. 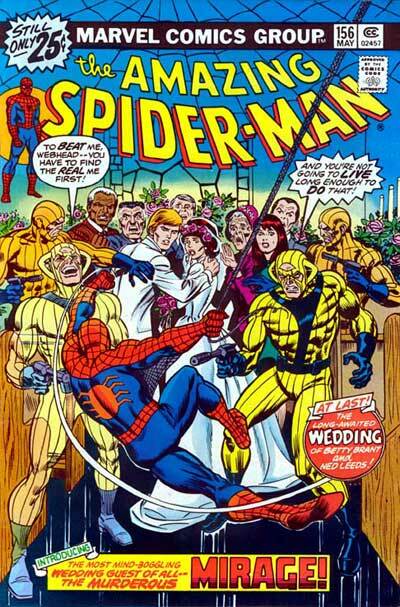 First appearance involved him and his gang robbing weddings including that of Betty Brant and Ned Leeds where he was defeated by Spider-Man. The Disruptor was a charismatic politician with ties to the underworld and possibly a criminal past. With the help of the Man-Monster, a creature created by Dr. Thaxton, he tried to get elected as Mayor of New York. 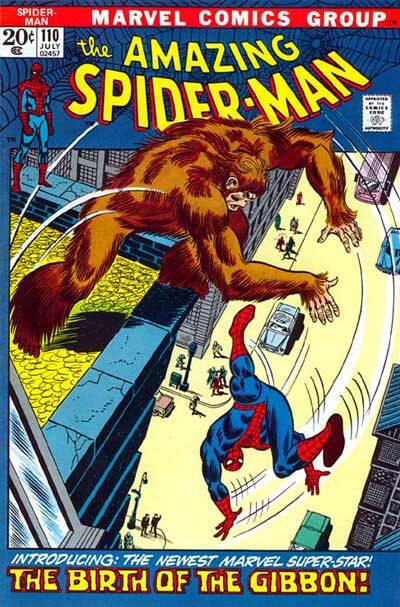 He was defeated in that bid by Spider-Man and was killed when the Man-Monster took revenge on him. The Smasher - I've got nothing on this guy. Anyone care to help me out and clue me in as to who this guy was? Rocket Racer aka Robert Farrell was originally a criminal. He snatched a courier's bulging briefcase. 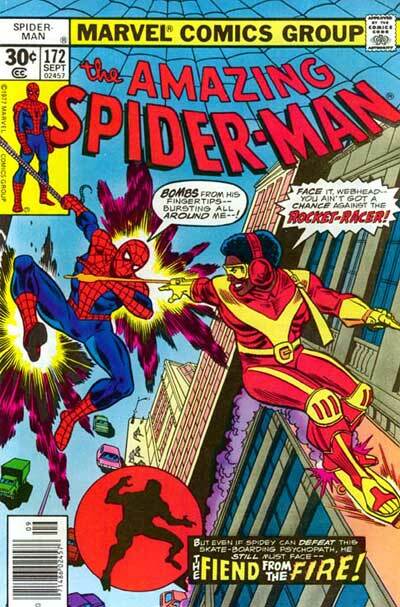 Spider-Man couldn't stop him because he was moving too fast on his rocket powered skateboard. 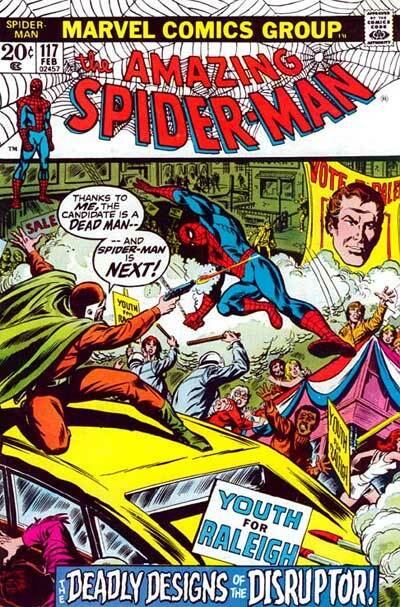 However, a car pulled out in front of him suddenly and Spider-Man was able to defeat him and leave him with the police. Will O The Wisp - Jackson Arvad was the chief scientist for electromagnetic research at the Brand Corporation. During a laboratory mishap, a gravitic energy surge shattered the "magno-chamber" in whose vicinity Arvad was working. The accident plunged Arvad's body directly into the magno-chamber's self-sustained electromagnetic field, and the residual high frequency field weakened the electromagnetic attractions between the molecules of Arvad's body This caused the molecules of Arvad's body to gradually disperse. Arvad soon discovered, however, that he possesses a certain degree of mental control over the dispersion of his body's molecules. Unfortunately, every time he relaxed control over his molecular cohesion, it was more difficult for him to resume a solid state. Here are the villains from this era that have managed to move off the D list. The Jackal - Prof. Miles Warren was once a professor of biochemistry at Empire State University. At some point, he studied genetics under the tutelage of the High Evolutionary, but was expelled from the Evolutionary's headquarters when he proved to be unstable. He received further training and equipment from Maelstrom. Warren fell in love with one of his students, Gwen Stacy, who was the girlfriend of Peter Parker. After Gwen was killed by the original Green Goblin, Warren turned his attention towards methods of cloning, inspired by the creation of a full-grown frog to attempt to clone humans. When he killed his lab partner Anthony Serba (who had discovered the truth) Warren became completely insane, developing the personality of the Jackal as he tried to convince himself that someone else had killed his assistant, rather than he himself. 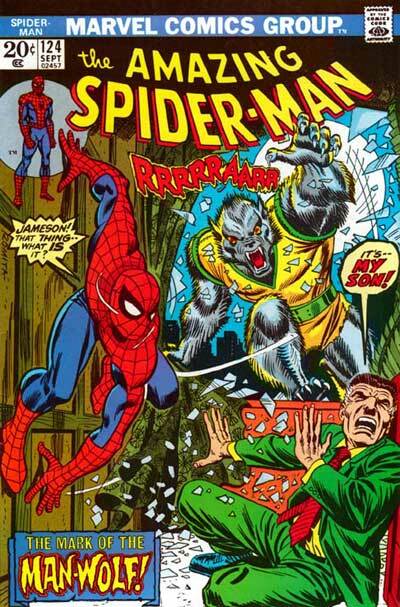 Man-Wolf - John Jameson, son of newspaper mogul J. Jonah Jameson, was one of the youngest applicants to ever be accepted into NASA's astronaut program. During his first mission, in which he orbited Earth, Jameson's capsule developed a faulty guidance module which caused the craft to spin out of control. The fledgling adventurer, Spider-Man, who had just begun his career weeks earlier, managed to rescue Jameson by getting a replacement guidance module to the plummeting capsule. 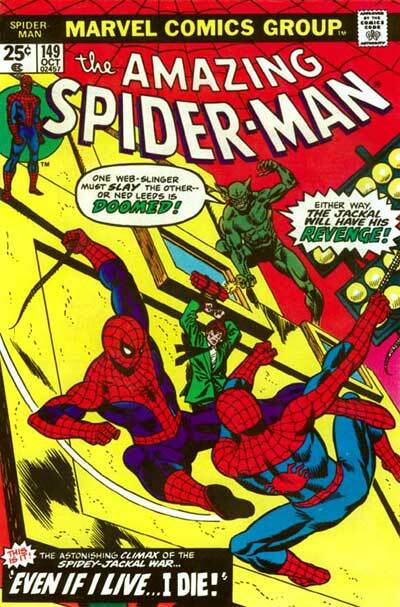 This incident, which Jameson's father construed as a publicity stunt to upstage his son's accomplishment, provoked the one of elder Jameson's first editorial denouncements of Spider-Man. Are Comics Shops In Danger?